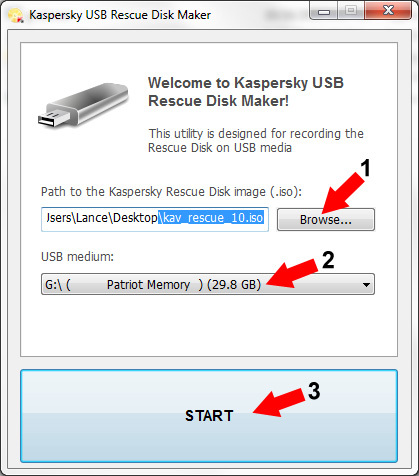 Creating a Bootable USB Kaspersky Rescue Disk from Kaspersky Rescue Disk 10 ISO is relatively simple, thanks to “Kaspersky USB Rescue Disk Maker“. Kaspersky Rescue Disk is a free stand alone antivirus tool that was designed to scan and disinfect computers that have been infected. The tool is natively available as an ISO, but can be extracted to a USB Flash Drive via rescue2usb.exe. Insert a 256 MB or larger USB Flash Drive and launch rescue2usb.exe, installing to a folder on your desktop. Once the tool has finished, simply restart you computer, set your system BIOS to boot from the USB device and proceed to boot. If all goes well, you should now be running Kaspersky Rescue Disk from a USB Flash Drive!